Automatically assigned to newly created users. Read and write permissions are enabled for the users. It is not shared by any other user. Specify a path for User Home Root. This must refer to a valid path on the machine where SynaMan is running. 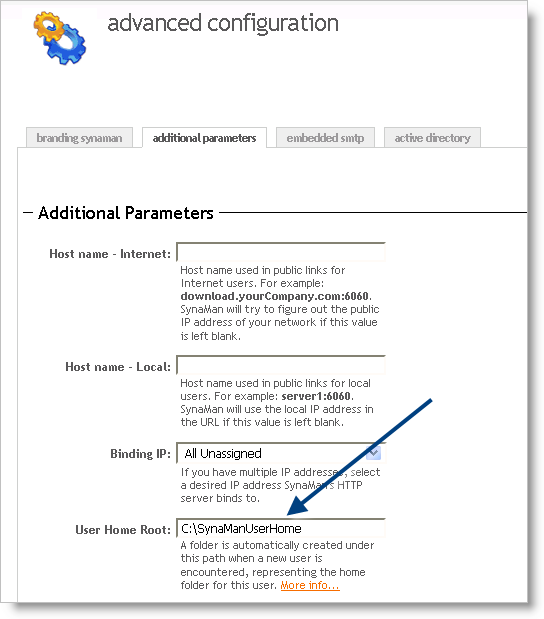 Value specified for User Home Root serves as the starting path for every user's home directory. Consider the following scenario. When John Doe logs in, he will see a virtual folder called Home. You can optionally add files to user's home directory at creation time. To do that, modify $INSTALL_DIR\config\UserHomeTemplate.txt file. This file should contain one file name per line. Every file that appears in this file will be copied to user's home directory.